Guys how do I not have a raita recipe on this blog yet? I loooove raita in all shapes and sizes and flavours. I’m up for anything. Anything at all in my yogurt because yogurt is just the best. 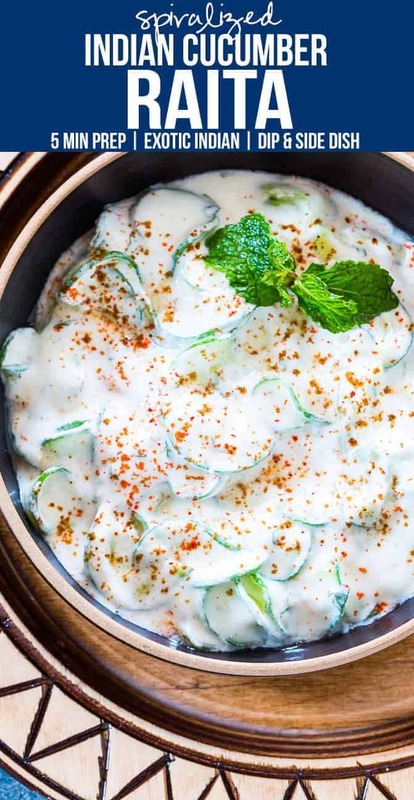 This Indian spiralized cucumber mint raita is my way of fancying up one of my favourite foods by spiralizing the cucumbers. Perfectly legitimate way to jazz up boring old raita. Because cucumber noodles…soooo good! BTW we had a fantastic weekend last week! A close friend wanted to throw a surprise birthday party for her husband (who’s also a close friend) and the theme was New Orleans because he is crazy about NOLA. I was in charge of food for THIRTY people. Yes, thirty hungry people. I started off being super nervous but it all went so well. Basically Denver and I went online, looked at a menu from a really famous New Orlean’s restaurant and picked a few things off it. We did Shrimp Po Boys, Cheesy Slow Cook Roast Beef Fries and a hugeee pot of Seafood Gumbo. Another friend made Hurricane pitchers for everyone, and it was a super duper hit! I’m just excited that I got to cook so much. Which is weird right? People think it’s weird that I get so excited about cooking. Not you guys I know, just people. But coming back to this raita. Raita is sooo simple to make guys, and can almost be a substitute for main course if you add lots of veggies to it. You can go totally crazy here. Just whisk some curd, add a little cumin, chopped mint and salt and chop up some veggies to mix in. Not just veggies, even fruits. Think potato raita, pineapple raita, carrot raita, onion raita and even plum raita, which I’ve heard is delicious! Chill it in the fridge for a bit and you are all set. And if you are hungry right away, snack on it with some pita bread or lavash or even papad. So versatile, right? If you are fun like me, spiralize your veggies and go to town with them! It just makes raita so much cooler and your guests will be raving about your cool, new way of serving it! 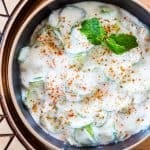 Get this easy Indian spiralized cucumber mint raita recipe and make it for your next potluck or party. 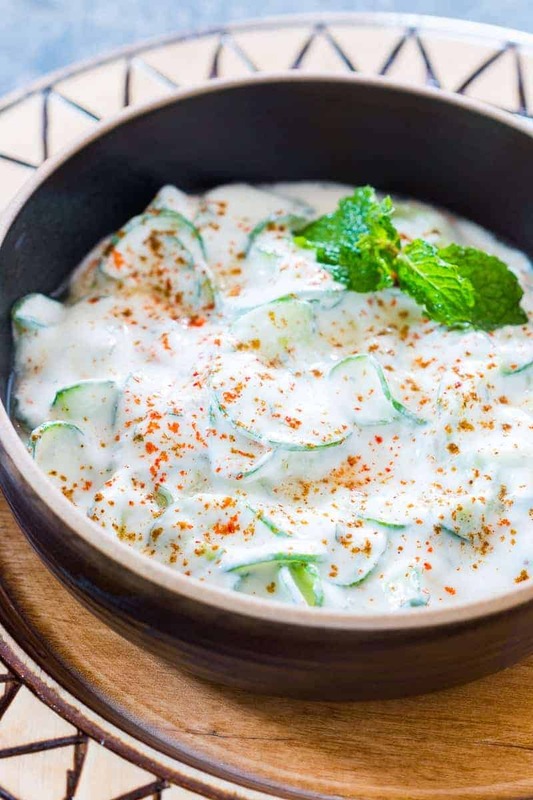 Nothing like a refreshing bowl of raita for a perfect side dish. Feel free to add boondi, carrots, onion, cilantro, beetroot, pineapple, potato, tomato or any other veggie of choice. This is like an Indian Tzatziki sauce, and is perfect with biryani too. Whisk together yogurt, salt and cumin in a bowl till smooth. Add cucumber, mint and green chili and mix till combined. Refrigerate for an hour or so for the flavours to blend and serve. 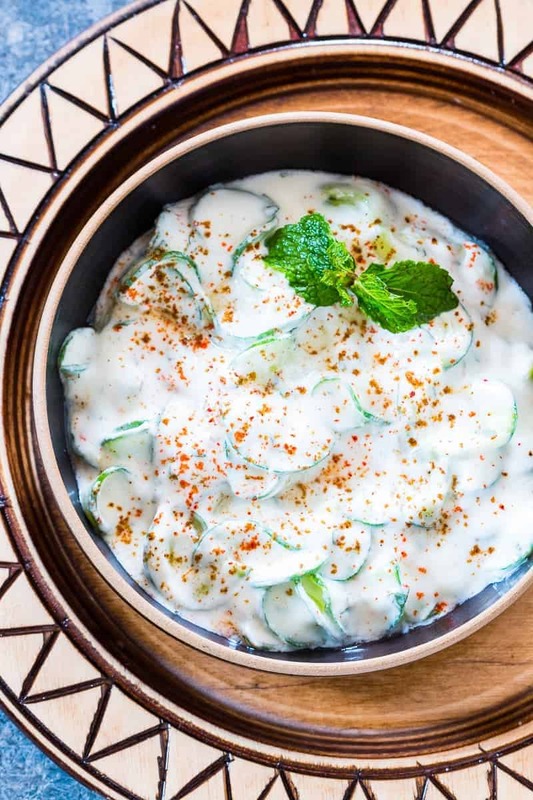 Refrigeration might make the cucumbers leave water, but you can just mix the raita once more before serving. Made this tonight. Totally rocks and pairs great with Indian Butter Chicken, yum!!!!! Yes it totally totally does! 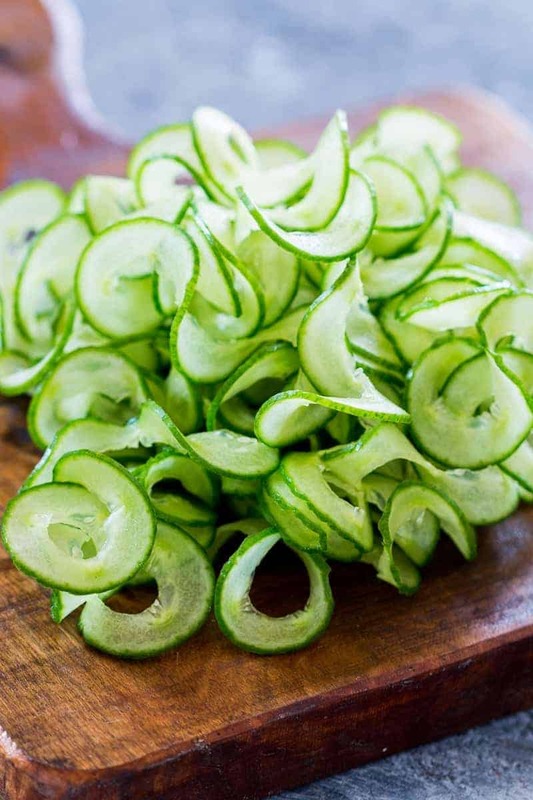 I love how you spiralized the cucumber! I try various such with cucumber, but can never it right!